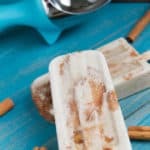 Ditch the crust, but not the flavor on these delicious Paleo Apple Pie Ice Pops. It’s the perfect treat year round that everyone will love! While summer is almost over, it’s still hot here in San Diego. And no matter how cool the weather gets, my kids still beg for yummy frozen treats. It could be the dead of winter (which can get to about 50 degrees where we live – yes, I know that’s still warm compared to where many of you live but it’s still cold to us), and my kids will ask for a popsicle. There’s just something about a dessert on a stick. I have a some gluten-free dessert recipes that I make, but sometimes we want to try something new. 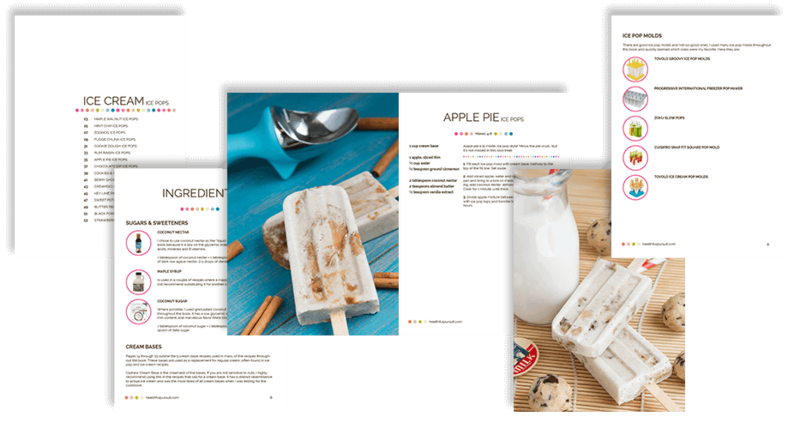 Then I found this Apple Pie Ice Pops recipe from Leanne Vogel of Purely Pops – a cookbook featuring 45 popsicle and ice pop recipes that are vegan, gluten free and Paleo. Best of all they’re made with real food ingredients. I get my other kitchen pantry supplies like sea salt, black pepper, spices, coconut oil, and other essentials either on Amazon or my local health food store usually. 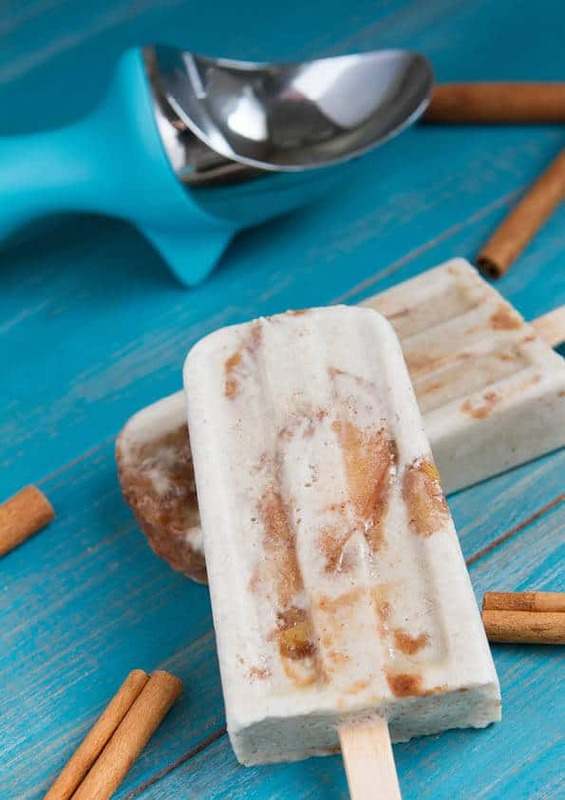 Did you try these Apple Pie Ice Pops? Don’t forget to rate the recipe and comment below to let me know how it went. You can also FOLLOW ME on Facebook, Instagram and Pinterest to see what other fun things I’m getting up to. Who loves apple pie? Me too! In fact, it will soon be apple picking season in Southern California, so I can’t wait to make this Paleo Apple Pie Ice Pop… it’s like apple pie a la mode minus the crust. It’s made with cashew cream – a non-dairy cream base that makes this popsicle really creamy and delicious. Who’s ready to dive in? Add all ingredients to the jug of your blender (this is my favorite blender). Blend on high for 1 minute. Fill each ice pop mold with cream base, halfway to the top of the fill line. Set aside. Add sliced apple, water and cinnamon to a small frying pan and bring to a boil on medium-low heat. Once boiling, add coconut nectar, almond butter and vanilla extract. Cook for 1 minute, until thick. Divide apple mixture between the ice pop molds. Cover with ice pop tops and transfer to the freezer to chill for 8 hours. Want More Paleo and Gluten-Free Dessert Recipes? 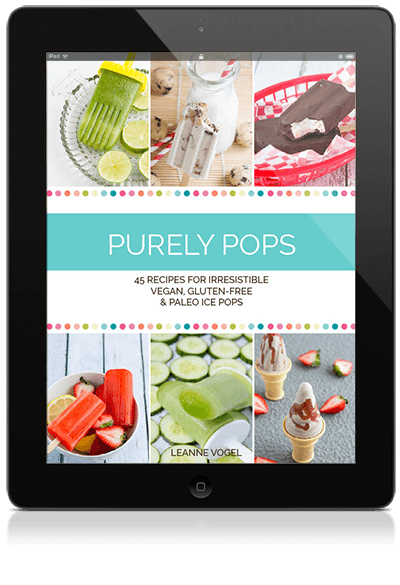 Try Purely Pops – a no-bake cookbook with 45 easy-to-make recipes made without dairy, eggs, nuts, wheat, gluten, grains, bananas, sesame or soy. All of the recipes are vegan, gluten free and Paleo – and they are absolutely delicious! Healthy, delicious and decadent recipes – including Cookie Dough Ice Pops, Rum Raisin Ice Pops, Mint Chip Ice Pops (one of my faves), Butter Pecan Ice Pops and much more! And there’s a WHOLE chapter on ice cream on a stick. YES! Purely Pops Cookbook is filled with gorgeous recipe photos and easy-to-follow instructions. Plus, there aren’t a ton of ingredients to buy. You probably already have most of it in your pantry or refrigerator. Eat healthier, eliminate processed foods and ingredients, and enjoy saying YES! when your kids ask for ice cream or popsicles with the Purely Pops Cookbook. It’s just $10 for this PDF e-book, and you can read it instantly once you download it to your iPad, Kindle or any e-reader. You can even read it on your laptop or computer. What a great idea, these sound so yummy!